Direct from disk digital audio playback in background. Hardest part is file access controlled by regular interrupt, what is necessary to achieve constant playback and minimal system load. Works on STE, Mega STE, TT & Falcon. Screen from GXP Little GUI program for showing and saving screen from gamestate snapshot file (Gamex saves). Saving goes in Degas PI1-PI3 format. RAMTOS.ZIP this is known as SELTOS - allows usage of different TOS than is built in machine by running it in RAM. Supported is V. 1.00, 1.04 and 2.06. UK, US, German and Swedish (Only 2.06). There is 2 executable: RAMTOS loads and installs first supported TOS ROM image file what finds in current DIR (good for AUTO run) and SELTOS which looks for supported TOS ROM images in current DIR (up to 9) and allows selection which to install. FLOFOR.ZIP Floppy formatter for Atari ST machines. Intention was to make program with flexible parameter settings, good overview of floppy structure and easy usage (with predefined formats). Some extra features: possibility to add small drawing code in bootsector, what is good as virus detection (if no animation by boot it is usually caused by some virus). Marking whole track as bad instead only detected bad sector's cluster, what will increase reliability (and decrease free space little). Program will create skewed sector order by tracks, what ensures fastest possible read/write . SETT2K.ZIP Time setting program for machines without special RTC chip. It uses IKBD as time keeper, so after reset we can set correct time automatically. Place it in AUTO folder, of course. Since IKBD chip is not ready for year 2K and after, we use little trick: write there 20 years less, and by reading add 20 years. So, PRG is good for period 2000-2019. Here is a description how to add battery power for IKBD chip, so it can count time when ST is powered off: IKBDBATT . IMGRFWS.ZIP Makes possible running of many games from hard disk instead of floppy. Principle of work is usage of floppy image files (ST and MSA) and mapping them to logical drive A. For easier usage there is special version which performs some ROM code in RAM, therefore we have separated versions for TOS 1.02, 1.04, 1.62/1.06 and 2.06 . 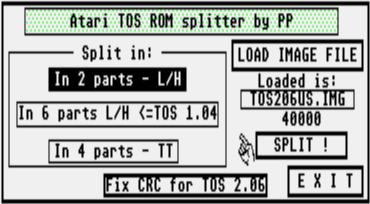 ROMSPLIT.ZIP Splits Atari TOS ROM image files in parts used by EPROM burners. New feature is CRC checksum recalculation and fixing for TOS 2.06 in case of some modding, patch. Floppy drive RPM measuring PRG Accurate measuring of floppy drive's rotation speed. For all ST(E), Falcon computers. There are some slight variations between models. Screenshot is from STE in PAL mode. Mega ST has PAL refresh rate of 49.983 Hz . Hddriver Timer C fix needed by some games where Timer C is changed by run, and they stuck. 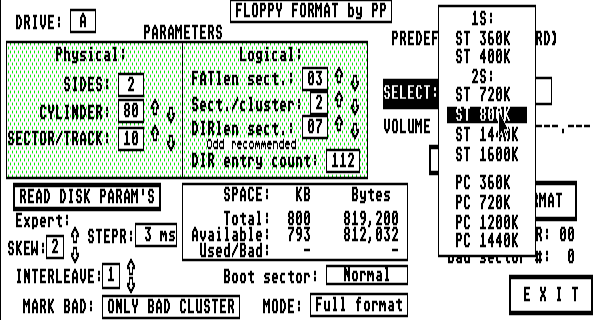 512K - 1M couple small programs for setting machine to act like 512K or 1MB one. P. Putnik May 2008.- March 2011.